This tour takes you to the historic Richmond village and local vineyards. Richmond has some of the oldest colonial buildings in Australia including the famous Richmond Bridge and Gaol with predates the better know Port Arthur. It contains many boutique shops and galleries. This tour commences visiting 3 premium vineyards in the Coal River Valley region, where you will sample a selection of fine Tasmanian wines. This tour also includes a light platter lunch at Puddleduck . Pooley Wines On the outskirts of Richmond, on the Butchers Hill, sits the magnificent heritage listed Georgian building, Belmont Lodge. Here, the cellar door wine tastings are offered in the rustic charms of the sandstone stables. Wicked Cheese Award winning boutique cheese maker based near Richmond. Richmond here you will enjoy a relaxed time to explore quaint galleries& boutiques. 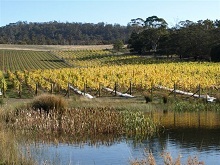 Visit the Richmond Tasting House and take advantage of our discount voucher. Departure: The Richmond & Wine Tour departs outside the Tasmanian Visitor and Information Centre, Hobart (corner of Davey & Elizabeth Sts) at 09:30am on Monday & Friday. Drop off: at your Hobart CBD hotel at approximately 2:30-3:00pm.